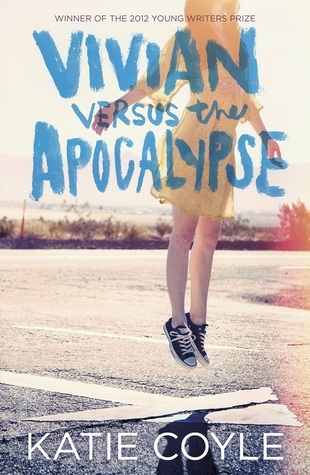 KATIE COYLE on the Best Cover in Human History (Her Own) + GIVEAWAY of VIVIAN VERSUS THE APOCALYPSE! 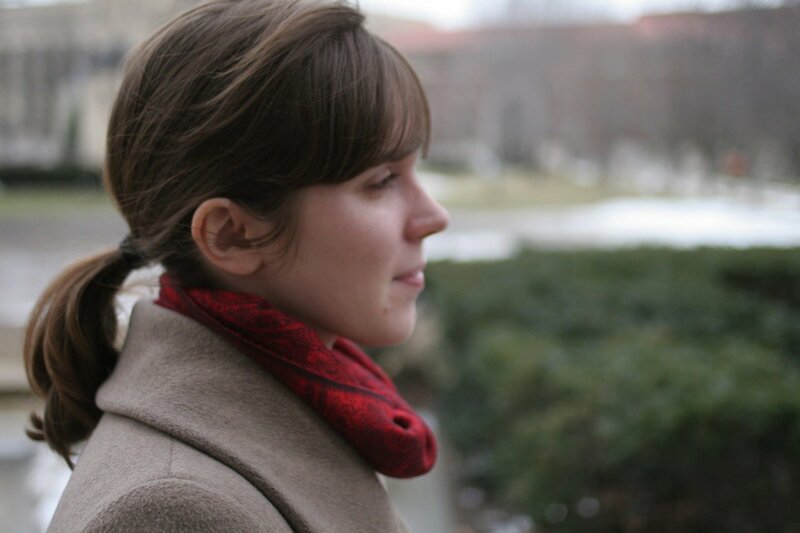 Today on the Debutante Ball, we have the pleasure of young adult fiction author Katie Coyle’s company. Katie won the Hot Key Books Young Writers Prize with her novel VIVIAN VERSUS THE APOCALYPSE, which will be available in the United States next year. Katie has offered to send a copy of Vivian Versus the Apocalypse to one lucky commenter; details are at the end of this post. Welcome to the Debutante Ball, Katie! I am a writer and not a designer for a reason. I understand the world through words—stories and signs and snippets of conversation. I am a really boring person with whom to go to museums, and if for some reason you ever require somebody to draw you something other than an adequate stick figure, I am not your girl. If we should ever find ourselves together on a mountaintop, overlooking some majestic, otherworldly vista, you will recognize me as the woman standing off to one side, conspicuously eavesdropping on her fellow tourists, writing snippets of their dialogue in a notebook with a poorly-concealed look of glee on her face. These were terrible ideas, obviously. I knew that whatever the good people at Hot Key Books, my brilliant UK publisher, came up with would be better than these. But still I wasn’t prepared for the image that would greet me in my inbox in early April, when my editor sent over the prospective cover art, hoping that I’d like it. I think it’s probably a bit uncouth to throw around words like “best” and “in human history” when talking about your own book cover, so I won’t. All I will say is that I immediately fell in love with it—I loved the striking blue of the title, the bold font, the strange and haunting image of the girl ascending. I love the shadow she casts below. It’s not a literal depiction of any scene from Vivian, but it captures exactly what I hoped it would: both the spooky unknown of Viv’s situation, and the strangely exhilarating thrill of being left behind. Most of all, I loved the random detail of the Chucks on the girl’s feet. They were my high school footwear of choice, and to see them there, on the cover of my first book, felt a little bit like how I imagine a parent must feel, looking into their kid’s face and seeing themselves. Like—oh, right! I made this! This is me! My book will be published in the US next fall, and I haven’t seen the cover art yet. But I do know that I will always have a soft spot for this cover, so perfect for my first book, the result of a lot of hard work and eavesdropping, revisions and rejections, the Chucks-wearing girl I was in high school and all the people I’ve been since. Have you ever bought a book just because you loved the cover art? What was it about the cover that grabbed you? GIVEAWAY! Comment on this post by noon EST on Friday, December 20th, and you’ll be entered to win a copy of Vivian Versus the Apocalypse. Follow The Debutante Ball on Facebook and Twitter for extra entries—just mention that you did so in your comments. We’ll choose and contact the winner on Friday. Good luck! Katie Coyle grew up in Fair Haven, New Jersey, and has an MFA from the University of Pittsburgh. Her debut novel Vivian Versus the Apocalypse was a 2012 winner of the Hot Key Books Young Writers Prize. Her short fiction has appeared or is forthcoming in One Story, The Southeast Review, Cobalt, and Critical Quarterly. She lives in San Francisco with her husband, and blogs at katiecoyle.tumblr.com. Follow her on Twitter at @krcoyle. However, your title and description have completely won me over. I will definitely be reading Vivian Versus the Apocalypse. It sounds exactly like my kind of book (well, maybe except for the “little bit of romance part… 🙂 ). No, less, I’m afraid. I’m not unromantic, but at my age teenage romance has lost its excitement, expecially with all the teenage love triangles and so on in books these days. It sells, I know, and that’s fine, but the romance I want to read about would be more like The Thin Man. Philadelphia Story, Holiday (heck, even Tony and Pepper in the Iron Man movies 🙂 ). But, as I say, everything else about this book sounds like it was written for me. Anthony, just so you know–there is no triangle in VIVIAN, and The Thin Man/The Philadelphia Story/Holiday are probably my three favorite movies in the world. Maybe some of that seeped into the book? No promises, though. Damn, this book just sounds better and better. I do pick up books for their covers, but it’s the descriptions on the back that really get me! I’m a sucker for a good synopsis. I’ve picked up books because of the cover before. Especially as a marketing scheme, I think the cover has a lot to do with drawing my attention in when it comes to books I’ve never heard of. Most often, when it comes to browsing for a new title without hearing anything about it first, I look for something that can say things about the book without embarrassing me too much on the train. If I’ve heard of the book and am excited about it, then I don’t mind what the cover looks like. Hi CL, thanks for visiting the Debs and Katie. I’m not a huge Kindle fan but I bet there are QUITE a few readers out there on trains and planes secretly reading 50 SHADES on Kindles…. Hah! Will be so interesting to see how the US cover differs. I love your cover, Katie! I love the contrast of the blue and yellow and how the image of the girl suspended in mid-air makes me look twice. I can relate to so much of what you went through. I actually never gave my cover much thought either, because I’m SO not a designer and every time I tried to imagine a cover, it was always something horribly cheesy or literal. But like you, when I saw the concept that’d become my cover, I felt like I recognized it. Thanks for being our guest at the ball this week! Congratulations on your debut! Gasp. I have to have this book. It hits a lot of my hot buttons for favorites. But mainly, my daughter is named Vivian, and I have to blow up this cover and hang it in her room, immediately. I almost hate to admit that cover design matters to me, but then, there’s something to be said for a really well-designed object on the shelves. The book might not appeal to me once I’ve picked it up and had a look at it, but there’s got to be something that draws you to that particular book in the first place. For me, it’s either cover design or title. I’m very easily won over by a clever title (Not Wanted on the Voyage is a pretty good one, and how can you walk past A Heartbreaking Work of Staggering Genius without needing to see if it really is all that?). I’ll pick up anything designed by Natalie Olson (http://kisscutdesign.com/). Her work is amazing. The cover design for Vivian is fantastic, and I would love to know who did it. The transition between the bleak, washed-out landscape and the warm light she’s ascending into works so well. This book sounds amazing and I love the reference you made (in comments) made to The Thin Man & Philadelphia Story make me want to read it all the more — two of my all time favorites. Your book cover is amazing. As for buying books based on covers, it’s increasingly difficult to do that since I rarely see physical books before I buy them and read them. BUT recently I bought The Good Lord Bird and if I’d seen it in person first I’d have bought it for the cover — just amazing… the look and the texture, too. Um, I think I missed this giveaway due to eating more food over the holidays than humanly possible and avoiding work. Looks like a great book! ha, Andrea. Yes, you missed it, but thanks for the comment!